This week, I’m excited to share some major development updates on Gears of Eden. If you’ve been following us on Twitter lately, you know we’ve begun experimenting constructing bases in our game. After testing a few different approaches, we’ve been able to refine our process and begin proper construction on a base that you’ll discover in the demo. Above, you’ll see a video of our in-progress base design. These bases are constructed using a modular tool, and then will be customized with additional modeling and texture work. We aim to have at least two base locations in our first demo, and we want them to tell part of the backstory to Gears. Even without updated textures or finalized design, you can tell this base has some history to it. Discovering what that backstory is, and the implications that story holds for your future, is an essential element in Gears of Eden. Of course, we’re not there yet. This is only a preliminary stage of development our art team is working on while our programming team wraps up work on an essential system, crafting. Above (we are so on top of it with the images this week), you’ll see an image of the latest version of our crafting system at work. Yes! You can actually make things now! 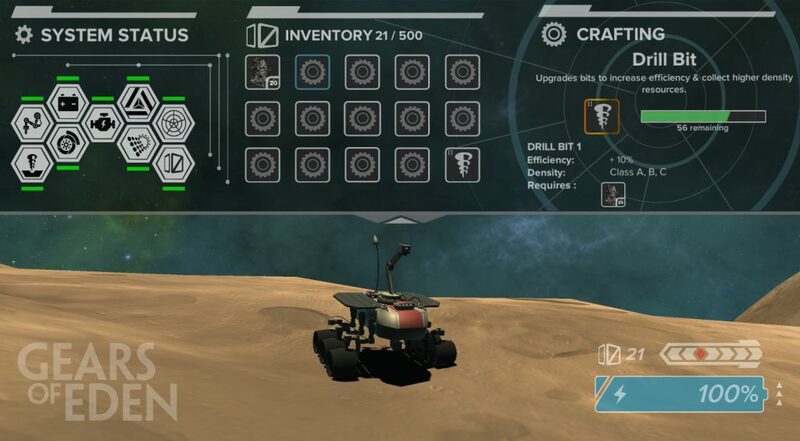 In this image, you can see a Tier II drill bit has already been crafted and added to the inventory, while another is underway. Crafting parts involves time sinks, so I should mention our current poll is collecting your input on how long those crafting time sinks should be. Up next, we undertake another a bug-squashing sprint. We’ll start working on addressing problems that have been coming up lately, including the ones I told you about last week. Then can we really get down to work on base development by continuing work on design and the base mechanics. In addition, our writing team is going to be looking at what story elements we want to include in the demo release. For more on all of this, keep checking back! Thank you so much for supporting us here at Gears of Eden! If you’d like to see all of the latest updates for our project, be sure to follow us on Twitter and Facebook, or even sign up for our newsletter! Don’t worry, we won’t spam your e-mail, and you’ll be entered into the drawing for a free Alpha Key! Of course, maybe you don’t want to rely on luck, but still want to get your digital mitts on one of those digital keys. Maybe you’re just super generous! No matter the reason, we would be eternally grateful if you popped on over to our donations page to help us fund the project. Thank you again and I hope you have a wonderful rest of your day!